Chocolate... the food of the gods. Luscious, decadent, even ambrosial, a girl's got to have her chocolate - at least I do. Imagine my elation when midday on my birthday I found none other than a box marked "Godiva" on my doorstep. Tearing open the package I found, thanks to Godiva Coffee and the Foodbuzz Tastemaker Program, not one, but two 12 oz packages of Godiva Coffee. Immediately catching my eye, the Godiva Chocolate Truffle Coffee nearly jumped up and down begging to be used. Not to be outdone, the package of Godiva French Vanilla Coffee made its presence known as well as we held them both up for close examination. Liv immediately requested a frozen, blended, whipped concoction filled with ice cream and additional chocolate, but not having earned my barista degree yet (stay tuned...), we opted for a simple iced coffee to get started - Godiva Chocolate Truffle style! I'm must preface my thoughts by stating that I am a coffee purist. I don't do flavored coffee very often, though on occasion certain flavors really do hit the spot, and I opted in on this offering knowing that my kids would love some of the iced blended coffee drinks we would be able to create with the Godiva Coffees. However... I must admit I'm no longer sure there will be any Chocolate Truffle Coffee left for us to experiment with if I don't stop my afternoon iced coffee treats. Godiva describes their coffee as a "pleasant pause in your day" and they hit the nail in the head with their apt summation. Rich, luscious and creamy, this iced coffee ranks up there as one of the best I've ever had. Perfectly roasted Arabica coffee beans are blended with Godiva flavors, in this case bringing a touch of chocolate to the cup. As I many times enjoy a piece of chocolate along with my coffee, the combo is a homerun for me. Not being able to leave well enough alone, and definitely not helping my pre-Bahama Vacation waistline, I had a nagging memory of a Coffee enhanced cookie that had recently crossed my path. Further investigation turned up a recipe on Epicurious using ground coffee beans directly in the cookie. If ground coffee beans were good, I figured ground Godiva Chocolate Truffle coffee beans would be even better. 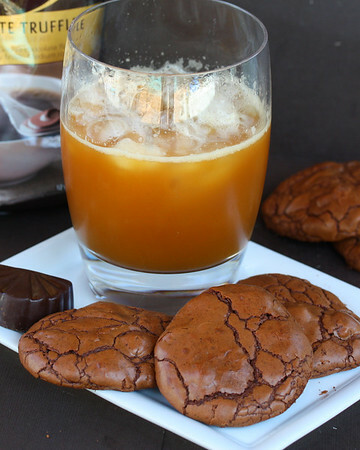 So... about that pleasant pause in my day, how about Chocolate Espresso Cookies AND Godiva's Chocolate Truffle Iced Coffee?? Yes, please!! One would think that I would be smart enough to stop there... however, tomorrow is always another day to start thinking about that swim suit figure. As I was working on said figure and walking through my local Carlsbad Village I stumbled upon the newly located Carlsbad Chocolate Bar, "Bringing chocolate to Carlsbad one piece at a time". Low and behold they just happened to have Chocolate Espresso Truffles. Truffles, Truffle Coffee, AND Chocolate Espresso Cookies?? Once again... Yes, please! Thankfully, Liv helped me polish off the treats as I sat in the sun taking my pleasant pause to my day. Thank you Godiva for a wonderful birthday treat! Using a coffee press (a birthday present to myself after receiving my Godiva Coffee!) I placed 1 scoop per serving Godiva coffee into the bottom. Pour 4 oz per serving very hot water over the coffee and let brew for about 4 minutes. In the meantime froth some milk (I used skim). Press coffee and pour into a glass. Add milk if desired, or only foam if you prefer (I like only foam). Pour coffee and milk over ice, sit down, and sip. Enjoy! Preheat oven to 350°F and grease 2 large heavy baking sheets or line with a silicone liner. In a double boiler or a metal bowl set over a saucepan of barely simmering water melt 1 cup chocolate chips and butter, stirring until smooth and remove top of double boiler or bowl from heat. Whisk in the 6 Tbs of unsweetened cocoa until smooth. In a bowl with an electric mixer beat eggs, sugar, and ground coffee on high speed until very thick and pale and mixture forms a ribbon when beaters are lifted, 3-4 minutes, then beat in the chocolate mixture. Sift the flour, baking powder, and salt into the chocolate mixture and stir until just combined. Stir in remaining chocolate chips and walnuts. Drop batter by heaping tablespoons about 2 inches apart onto baking sheets and bake in in middle of oven for 8 to 10 minutes, or until puffed and cracked on top. Cool cookies on baking sheets 1 minute and transfer to racks to cool completely. OMG - anything with coffee - I absolutely LOVE! Those cookies look sooooooo delish!!! What a fun tastemaker!!! I'm not a coffee fan but I'd devour a plate of those cookies. And the frothy concoction just sounds so good. May have to come down and check out that Carlsbad Chocolate Bar. Oh please send me a large cup of that iced coffee!!! It sound delish! I have received the red box too and Im excited to use it just as when I saw your post. Im now inspired to use them. I almost sipped the whole glass empty.. yeah it's tempting me haha! What a wonderful surprise you received on your doorstep, Kim! The weather has started to cool off a little up here although it's still quite warm. I would have welcomed a fabulous afternoon like this today :-) Hooray for summertime! A "food" surprise always makes me happy! =P This is a great tastemaker program! I love Godiva and that's one dangerous store. Both iced coffee and cookies look yummy!!! Your creations are certainly from the "Chocolate Gods." 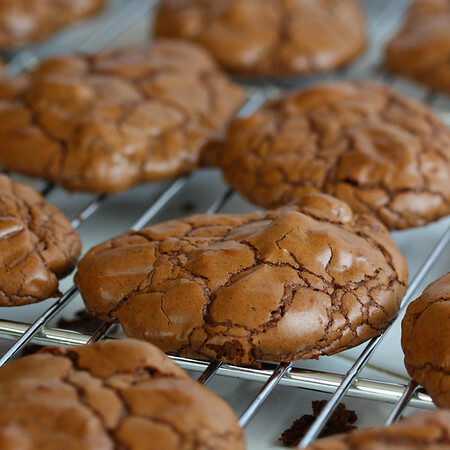 I'm bookmarking the cookie recipe to make, when it cools off. Temps will be near 100 today. I'll be making a similar coffee drink today! Aren't surprises wonderful? Luscious chocolatey post! Yes, I had to save both of these recipes like the chocoholic that I am. Thanks for sharing-Yum! I can't wait to get my samples:-) These cookies look delicious, such a good use of the coffee! I love Godiva chocolates and coffee. I can only imagine hoe good those are together and how amazing those cookies must be! Kim, this is too good and too funny - who cares about the Bahamas waistline? It looks so worth it! Heaven. Oh, my, Kim...you've caught my attention! Just fabulous! Oh this is heaven for a godiva chocolate lover! Can't wait to get Godiva coffee and make these! I am a coffee purist too, I don't like flavouring and I don't like sugar. Just the coffee and the cream! But I have developed a taste for it iced, which I love. Great post! The cookies look like they are to die for. I'm officially jealous... lol! This is my perfect midday snack! Love it! receiving free Godiva makes me wanna be a Foodbuzz FP. I love their chocolate, and even tho I don't drink coffee I'd definitely fell in love with these cookies. You really outdid yourself with the coffee and chocolate! I'd call that birthday success. YUM! this is heavenly!!!!!! Congrats on the top 9! Happy Birthday to you! I can picture the happy dance ;) You've inspired me to get started on my Godiva recipe - I've always been a purist when it comes to coffee and chocolate (prefer straight chunks of dark chocolate), but I'm rethinking that. Your enthusiasm is contagious! Kim - I'm out of the loop a bit this week and just now saw this. 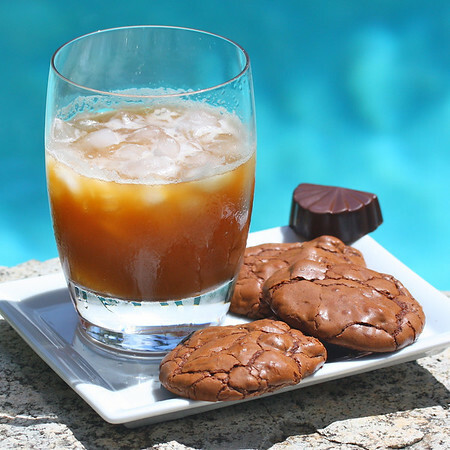 Your iced coffee and cookie combo looks wondeful! 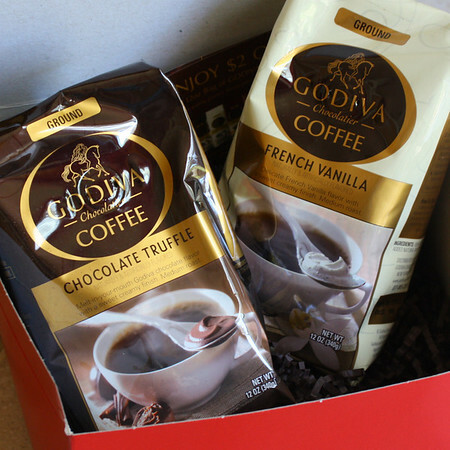 I received tso bags of the Godiva coffee earlier this week as well. I'm going to be brainstorming with my brother next weekend to come up with a summer coffee drink! MMMMMM... those cookies look incredible. And with Godiva chocolate to boot- yum! The perfect BUZZ to counteract this crazy heat! I love Godiva... Those cookies sound and look divine! I am not much of a coffee person, but my husband would love that drink! Great post... Can't wait to try these recipes - one for my husband, and one for me :) Thanks for sharing, Kim! You, my dear, are my new best friend! I got this email too but did not jump on it (though I wanted to) because I'm not allowed to drink coffee until I have this baby. I'm so glad that you were able to participate in this tastemaker option. One of us needed to be able to have this. And I'm glad it showed up on your birthday (happy belated birthday by the way). Thanks for sharing this and making me drool! 4 more weeks until I can have a cup of the sweet nectar of the Gods that I call coffee. Yum!!!!! As soon as the weather cools off, I'm making those cookies! I don't think your cookies could look any better next to that iced coffee. I just made these! So yummy! Yours definitely look better than mine. Any tips?